Good morning everyone. Today is going to be a yucky rainy day here in Dallas. Of course today is the day we are having our open house. Oh well I know we can't control Mother Nature. Last night I prepared some cookie dough so I could make some fresh cookies today for the open house. I couldn't help myself, just give me an excuse to bake and you know I will do it. I chose to make my favorite Oatmeal Scotchies. Today is Sunday so you know what that means, Potluck Sunday. I think it is my favorite day of posts because of all the yummy recipe contributions. So I want to say thank you to everyone who links up every week. Friday night is homemade pizza night at our house. We usually only make pizza twice a month, but now it is becoming our Friday night ritual. 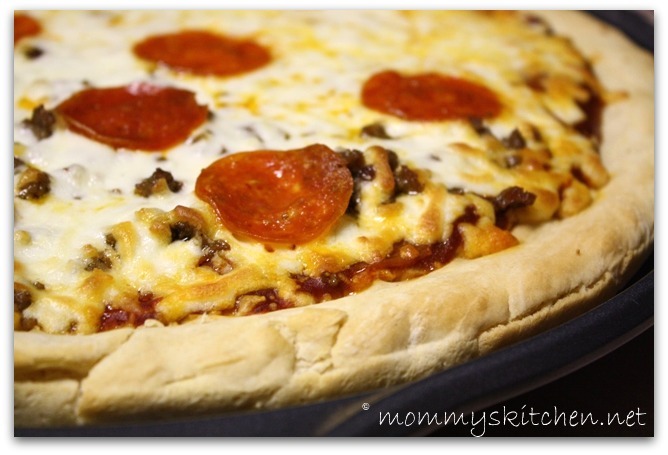 When I make homemade pizza I usually use my favorite quick and easy pizza crust recipe. Well, earlier in the week I had found a new No Fail Pizza Crust recipe that I just couldn't wait to try. 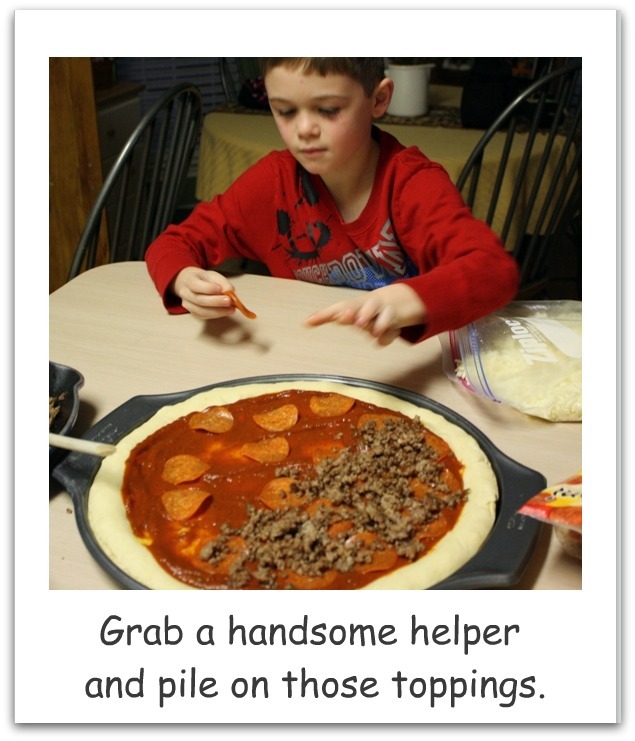 I found this recipe in my thrifty fun recipe newsletter that I receive. This newsletter had all sorts of great recipes from home cooks. The person who contributed this recipe got it from a friend from Sandhills Nebraska 30 years ago so I knew it had to be good. My favorite recipes are the ones from folks before us mom's, grandmas and great grandma's. I love that fact that this pizza dough does not have to sit and rise. I did let the dough rest for about 20 minutes, but that is just my personal preference. My husband loves a thin crust pizza, but I like a semi thick pizza crust that is chewy on the inside and crispy on the outside. That is exactly how this crust turned out. Perfection if you ask me. I know everyone has their very own favorite pizza crust recipe, but this one is my new go to recipe for pizza. I hope you will give it a try. In usual fashion the full recipe is at the end of this post. 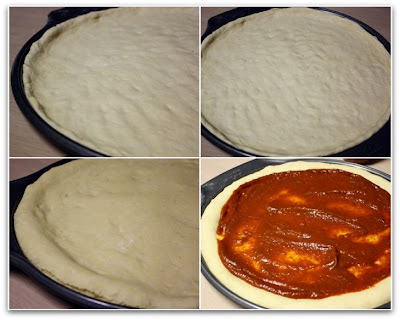 Here are some step by step photos of this perfect no fail pizza dough. It was really easy to work with and I had no problems stretching the dough out to fit the pizza pan. The pans we use have holes in the bottom for even cooking, but I still want to a pizza stone. Everyone I talk to says the stones make the perfect pizza crust. Carson helped me load up all our pizza toppings. We chose ground beef, sausage and pepperoni on one side and pepperoni and cheese on the other. I like to add two layers of pepperoni's one on the bottom and then more on top of the cheese. Dissolve the yeast in warm water and set aside. Mix the flour, salt and baking powder together. Add the softened butter and cut into the flour mixture using a pastry blender or fork. Add the yeast mixture and stir together to combine. Knead the dough on a lightly floured surface until well blended. Place the pizza dough into a oiled bowl and turn the dough to coat. Let rest for about 20 minutes. Cover the bowl with dish towel or plastic wrap while the dough rests. Preheat the oven to 400 degrees. Spray your pizza pan with non stick baking spray or brush with olive oil. You can also use a pizza stone. Press the pizza dough into the pan. Pre bake the pizza crust for about 10 minutes. Remove from the oven and spread with pizza sauce and add all your favorite toppings. Place the pizza in the oven and bake until the crust is golden browned and the cheese is melted about 10-15 minutes. Click here for an easy homemade pizza sauce recipe. Looks SOOO good! And yes, this rainy dreary weather needs to go... what happened to our sun?? lol Good luck with your open house! It sounds really good. I have a regular pizza crust recipe I use all the time, but it never hurts to try something different once in awhile. Our family has a weekly pizza night, it's on Saturday. I asked if they wanted to change it up and only have it twice a month, and it was met with a very loud, "NO!" lol There are so many different types of pizza anyway, it would be hard to get bored with it. Good luck on your open house! What a great pizza! It looks delicious and sounds easy to try. I'm so glad to find your blog and will enjoy following for more great recipes! Hi! Happy Sunday! I am sharing my recipe for Clam Chowder. It is a lighter version, so it is not heavy and thick with cream and flour. It's yummy! Now that is a pizza crust worth having for dinner. Those words no-fail really seem to describe it perfectly. I linked up to your party with Chocolate Trifle. It's raining down in Houston too. When we lived in MD, we always made homemade pizza when it snowed, might have to pick up your Friday night tradition. Love you potluck Sundays! We have used your other recipe for pizza night at our house. Since we have Friday night pizza/movie night at our house I'm anxious to try it too. I've never been able to duplicate a crust like the one our old pizzeria used to make, it was very tender and not chewy but held up to hefty toppings Chicago style. He also made his own sauce. I thought of asking him before we moved what the secret was, his family came from Sicily. He still speaks Italian to his children. I'm constantly searching for the perfect pizza recipe. Thanks! We have pizza Fridays at our house too :) I've never made the crust with baking powder, so I am going to have to try out your recipe. American Girl Primitives, I think we are all still searching for the perfet pizza crust. I love the part about speaking to the children in italian. That is so sweet. mrsking14, welcome and I am so glad your mom passed on the info to my site. Chicken Spaghetti is pure comfort food around here in Texas I am so glad you liked it. I am off to check out your blog. I look forward to trying your recipe for pizza crust....and was happy to also find a 'no cook pizza sauce' that was linked here too! Will be trying them out next week when my grandyoungun's come for a sleep over!! I just love your blog....and your Sunday linky party....I always look forward to it. I just found your site today!!! Love your recipes. Can't wait to try some of them and tips to. I subscribed via email! Thanks for doing this! I'm not the best in the kitchen so I hope I can try! You have an incredible recipe blog! I loved browsing through and seeing all the down-home cooking and the encouragement to make home cooked meals. I just linked up for the first time and hope to be back. Thanks for hosting. Does the butter have to be melted or softened? The butter just needs to be softened. I will add that to the recipe. I think I failed the no fail pizza crust...is it supposed to be very sticky and wet? If it is two wet just knean in some more flour. It should be about as thick as it is in the picture. Don't give up just try again. Just wanted to say that after reading through your recipe, I noticed that baking powder is the difference from all others I've tried. I opted to add it to my usual pizza dough recipe (which is almost identical to yours) and we were pleasantly surprised! The dough was awesome and it rose more evenly and crisped up very nicely on the bottom. We're really impressed and so glad I stopped by! This really is a no-fail pizza dough! my family loved it, I never would have thought to add baking powder to a yeast dough! what do you know, it made the crust soft and crispy on the outside and it actlly browned up like a real pizza :) thank you! Thank you so much for this! I've made this crust three times in 5 days for two parties and a test run. Everyone has loved it! I love that we can now make pizza at home without buying processed crusts!!!! Anyone try with whole wheat flour? What was the outcome? Thanks! Hello, greetings from Edinburg, Texas! I love how easy your pizza crust recipe sounds especially the part about not having to wait an hour for the dough to rise. Although I was curious, what type of yeast would you recommend using? Thank you! I decided to have homemade pizza this weekend ^^ Thank you for sharing the tutorial! Easy Peasy recipe. Almost like mine only I don't add the butter but will be trying this recipe for sure. Thank U.
Oh; don't tell me that is a round cast iron pizza pan? I have been looking and been wanting one. I do own and use my pizza stone all the time; except for pizza that is, and that is only because I don't have the paddle to slide the dough onto the hot stone. The stone you put in the oven before turning on the oven and having it preheat as the oven is preheating. Luv my stone.